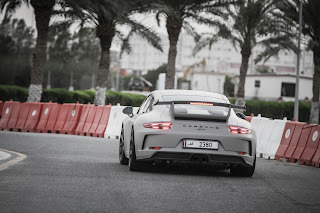 Home > Car Concept > News > Qatar Racing Club > Spotted > CHALK 2018 PORSCHE 911 GT3 SIGHTING IN QATAR RACING CLUB! 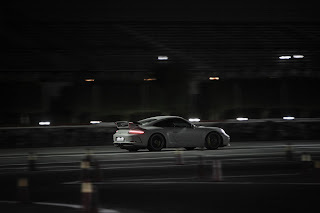 On startup, the GT3 revs up and sends a few pops out the back before settling into a crunchy, metallic flat-six idle. Quite a sighting at Qatar Racing club as they attempt a second track day of Autocross in there facility with Corner Addicts. Great turn out and good hits as a Toyota GT 86 made its quickest lap around the ever sliding perfect layout for time attack event. 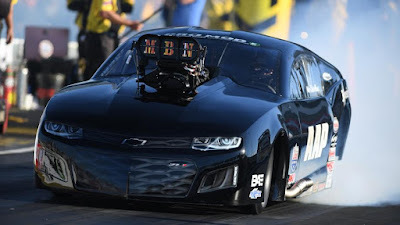 It ran a quick 36.13 on a chilly evening and is a story to watch out for next. But, thats not the reason you here to day. 2018 Mercedes-AMG C63 S Coupe with a sweet plate Spotted in Qatar Racing Club! 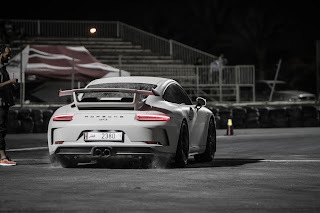 Being a track day one would be lucky enough to sight that random Subaru BRZ that went viral as the car that changes its color some time back which we still marvel at by the way, but what caught our attention was sighting the chalk 2018 Porsche GT3. Not your usual sighting at such an event. On startup, the GT3 revs up and sends a few pops out the back before settling into a crunchy, metallic flat-six idle,the GT3 is surprisingly normcore on the street and track.The GT3 is the track car from the track car brand. It’s been 18 years since the first 911 GT3 premiered, and since then, it's gone from hiding a 355-hp 3.6-liter flat-six to today’s 500-hp, 911 GT3 Cup-derived 4.0. It’s the only naturally aspirated 911 you can buy right now. Peak power is at a screaming 8,250 rpm while all 339 lb-ft of twist are available at 6,000 rpm. 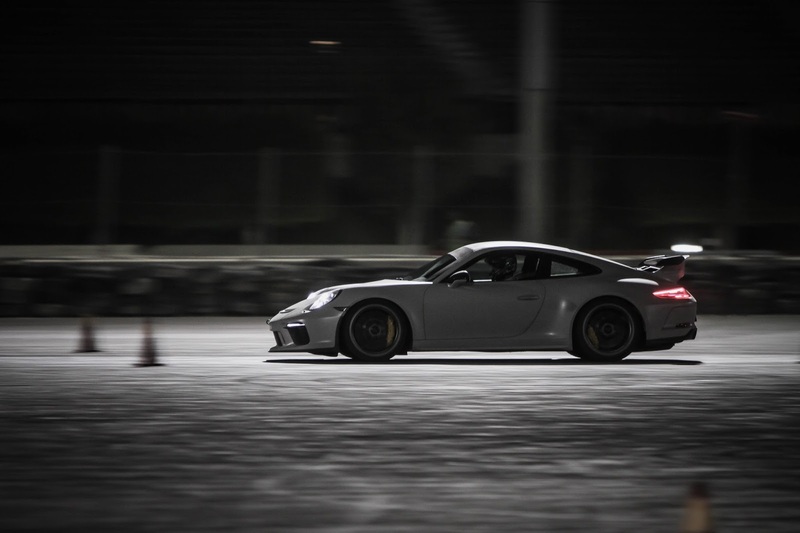 The seven-speed PDK-equipped GT3 is faster than the stick, with a sprint time of 3.2 seconds using launch control; the six-speed manual takes 3.8 seconds. The GT3 doesn’t get a seventh manual gear like the Carrera; Porsche tells us that’s because the GT3 doesn’t need a cruising gear. It's not for cruising. The PDK car takes 11 seconds flat to get to 124 mph, which we can basically verify after hammering down arrow-straight, desolate back roads near Granada. Terminal velocities (197 mph, PDK; 198 mph, 6MT) are achieved in top gear for both. We left Qatar Racing as dusk fall over our heads. 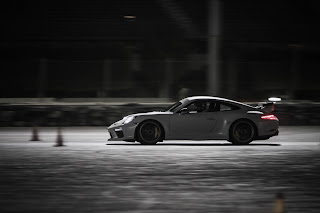 Lucky enough the floodlit circuit would add some intense epic feelings as the 'speedstar' sped off the corners in a smoothering way.Occasionally sliding in corners with a gleeing bliss. 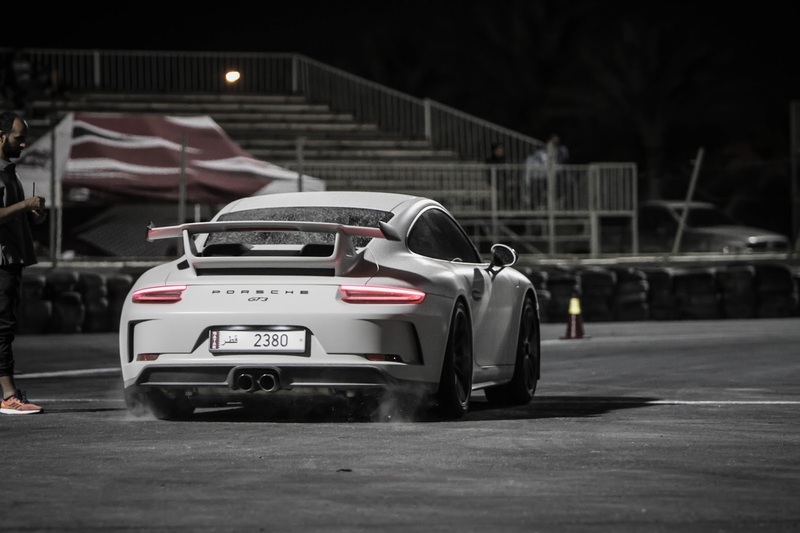 Autocross events are gradually becoming perfect car meet events here in Qatar. With first event having been hosted at Losail Circuit and now in Qatar Racing Club one can only hope we get some lucky temperatures and favorable weather conditions, before summer, is here to hold these events as random.